Welcome to CruiseAlong Pty Ltd owned and operated by Lance Mumby - Your personal Cruise Consultant. We are proud to be an affiliate of Cruise Holidays who operates a very select group of home based 'personal Cruise Specialists' franchised locations throughout the world with a turnover in excess of $300 million. Being fully licensed we can also assist you with your pre-cruise airfares/hotels/transfers/any tours you like and travel insurance. After selling cruises for 38 years we say "Australia's most experienced Cruise Agent" because we are and really, for us, Cruising is our life. 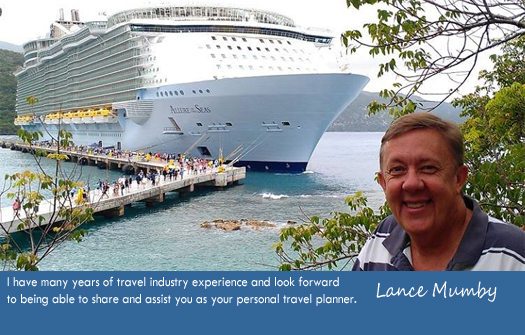 Lance was nominated for Cruise Consultant of the year 2 years running he also hold's a Diploma in Travel and Tourism, he has escorted over 30 cruise groups and was also a co-founder of Cruise Express, Balmain (Managing Director for 14 years). He has traveled to over 50 countries and cruised on more than 60 ships and inspected many more, he is also a graduate of the "Conde Nast Traveler Institute" and is listed on the Institutes website as a Cruise Specialist. Lance is also certified as a Travel Manager by the Australian Federation of Travel Agents (AFTA). Lance will offer you more than just a booking service he will advise you on the best cabin location for you and will always give you all the options and explain the differences not just the price. Our Agency is also 100% independent and as such can offer you any cruise line and also offer you past passenger benefits for all cruise lines. Click here to subscribe to our weekly newsletter and then you also receive Lance's Luxury Line emails from time to time that will offer you some very last minute specials that you will not see anywhere else. CruiseAlong operates under license and as an agent of Your Travel & Cruise Pty Ltd, ABN 69105940332, AFTA, ATAS #A10496. CruiseAlong is not an individual member of AFTA or ATAS.